Star of the County Down Guitar Tabs - Free Celtic Sheet Music! Star of the County Down guitar tabs will introduce your beginner guitar students to a terrific Irish song! This free Celtic sheet music will be a favorite of your students. It has a strong rhythm and wonderful, singable melody, and fun words! If you want to hear --and see! -- a fun rendition of this song, complete with fiddle, pipes, and drums, check out the "Orthodox Celts" on this YouTube video below. Vigorous, humorous, and very musical... my students and I have watched this video many times! When I have a really terrific piece like this that is also a song, I usually end up giving it to my pianists, guitarists, and singers alike. They all benefit, and frequently end up playing it together. Please scroll down the page for the link to the printable sheet music. Yes - I have made the rhythm double-time for the sake of young students -- if you want a version using eighth notes, check out the same song for voice. One of the great things about this song is the EASY chords used. Em, G, and D are three of the easiest chords for beginner guitar players. And CHORDS are what your guitarists will be playing when they get together with other musicians to play Star of the County Down... I have the guitar tab melody here so that kids can learn exactly how it goes. If you are interested in a fancier arrangement with more chords, plus lyrics to a Bible verse written to this melody, check out this page, "For God So Loved the World", at my new site, Sing The Bible Story. 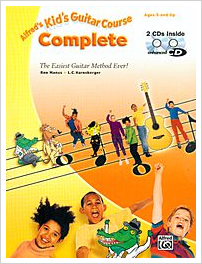 Thanks for a great web site and a very useful tool for us teaching guitar. Thank you so much for this site! I have just started teaching some really keen Y6 boys who want to play Scarborough Fair, and your version is perfect. I will now go and look at what other goodies you have! THIS SITE IS AMAZING!! I've been teaching guitar for about 5 years now, and I've only just found your website! (I could really have used it 5 years ago) :-) I teach at primary schools every week day for about 4 hours, so the beginner tabs you have are ideal. Thank you so much for your hard work getting these on the web, you have made many children very happy!! Do you have a story or a question about teaching guitar? Do you think it is a hard instrument for beginners, or easy? What have been your challenges?